FuzeBox, the developer of an online meeting software, has released a number of new APIs for software developers to include the company’s collaboration technology in third party applications. Similar to GoToMeeting or WebEx, Fuze provides a conferencing service that allows users to share screens and run meetings online. As opposed to its competitors, Fuze promises a sleeker more lightweight interface and recently debuted multi-party desktop and mobile video, HD quality conferencing. Fuze also offers apps for the iPad, iPhone and Android. 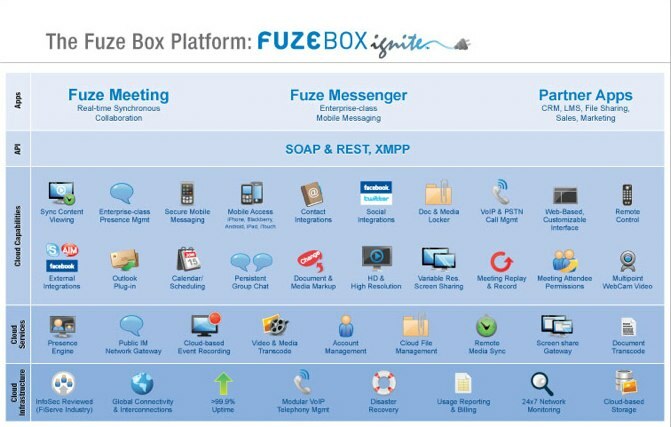 Under the new FuzeBox Ignite platform, the company is making Fuze Meeting and Fuze Messenger services, which are used by 2.5 million users, available for outside integrations. Through the FuzeBox Ignite program, FuzeBox will provide developers with technical documentation, software development kits (SDKs), sample source code, reference guides, and “virtual sandboxes” for testing new applications. Developers will be able to access FuzeBox applications from any platform, on any browser, and will be able to integrate content and desktop sharing, address books and more. And the FuzeBox Ignite API suite debuts with integration with Box.net, Dropbox, Elementool, eFront Learning, Knovial, Health Nation and Thomson Reuters. For background, the company, which was formerly known as Callwave, was founded in 1998 and went public in 2004, trading on NASDAQ under the ticker symbol CALL. The company eventually delisted itself from the NASDAQ and in the summer of 2009, the company rebranded itself as Fuze Box and launched Fuze Meeting. Fuze also launched Tweetshare, a platform for branded Twitter channels, and brought on streaming media inventor Dr. Alan Lippman its Executive Vice President of Media Technology.